"This is a flavorful summertime party drink." 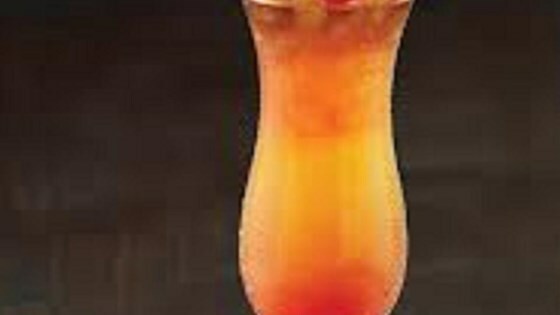 Stir the orange juice, pineapple juice, simple syrup, coconut-flavored rum, 151 proof rum, grenadine syrup, and fruit-flavored liqueur together in a 2-quart or larger pitcher. Refrigerate at least 2 hours, or overnight. Place 1 cup of crushed ice in each of eight 12-ounce glasses. Pour about 1 cup of the rum mixture into each glass, and garnish each with a maraschino cherry and an orange slice. Nothing says summer like this delicious adult drink! Use this recipe to make your own simple syrup. I cut this down to two servings, omitted the simple syrup and used Malibu pineapple rum. No 151, just plain ol' Captain Morgan's spiced rum. Yum! It's sweet, that's for sure. I use orange flavored Bicardi Rum for my fruit flavored option. So yummy! Definitely a party favorite since it disappears and I have to make another full batch.